So You Failed a Test... or a Whole Semester. What Now? So You Failed a Test… or a Whole Semester. What Now? Maybe you felt confident walking into the testing room. Or maybe you knew your chances were slimmer than the villain in Who Framed Roger Rabbit after he gets squashed by the steamroller. Either way, you failed a test. Let’s talk about how to bounce back from that failure. Failure isn’t the end of the world; it happens to everyone. Now, I think the main reason failure seems so monumental and terrible is that nobody likes to talk about it. We don’t want to put ourselves in a vulnerable position by revealing our failures – so we just tend to project our successes. As a result, people often have to deal with their failures alone. So in order to make it clear that you’re not alone – that we’re both on the same playing field – I’m going to put some of my own failures out there for all the world to see. For starters, I definitely wasn’t a perfect student. I did well in college overall, but I actually failed at least two exams (just going off of my memory). One was in a physics class during my freshman year, and the other happened in a computer networking class during my junior year – a core part of my major’s program of study. In that latter class, there were terms and concepts I had literally never heard of. I spent so much of my time in that class distractedly wasting time on the internet and doing other things that the lecture material went straight over my head. However, these two test failures pale in comparison to something that happened in high school – something I’ve wanted to keep buried ever since it happened. Thinking about it still makes me feel a bit of shame. During my senior year, I got a really cool part-time job at a small business in my town. I actually worked a lot of part-time jobs as a teenager, and did pretty well in most of them. Unfortunately… I was only at this job for three months. And that’s because I got fired – for reasons that were completely, 100% my fault. I didn’t listen well, I was too afraid of screwing things up (and thus wasted the owner’s time), and didn’t respect the freedom the position gave me. So they fired me. I was sure that no one would ever want to hire me again – why would they? I’d already violated the trust of someone who’d hired me. Looking back, though…. everything turned out fine. I still went to college. I still got hired at plenty of places during college, and even did a full-time internship. I used that horrible experience of being fired – as well as my experiences failing tests – as opportunities to learn lessons. Those failures represented low points in the volatile, messy progression of my life. Because that’s precisely how life goes. It’s not a nice, linear curve going steadily upwards as time goes on. Instead, it’s a chaotic progression of successes and failures. Peaks and valleys. Right now, you might be in a valley. But the failure that put you there almost certainly won’t keep you there. It’s just one low point in your life, and your next step will likely be upward. So, how do you process your failure and start moving up to your next peak as quickly as possible? That’s what we’ll cover in the rest of the article. In my mind, overcoming failure and learning from it is a process that breaks down into five distinct steps (the video has six, but I’m merging two here because of the written format). Let’s take a look at each. Before you do anything else, you need to assess the need for any immediate actions you need to take after your failure. For instance, let’s say you completely skipped a test. Obviously, you need to contact your professor right away to see if there’s any chance of making that test up – after all, it’s not your fault that ninjas attacked you on the way to the testing center, right? Failures seem monumental and earth-shattering when they first happen. Your emotions are running wild, blaring sirens in your brain… and they most likely won’t let you do much of anything useful right away. For that reason, I think you should take some time to step back from the problem and cool off a bit (after doing any needed damage control, of course). Vent to a friend, sleep it off, or play 7 hours of Goat Simulator. Whatever you do, just give your brain some time to let the emotions subside. Once that happens, logic and rationality can take over to start doing more useful things. Before you can dust yourself off and try again, you need to take some time to identify the causes of your failure. What went wrong? We do this naturally when we play video games; if you try to jump a gap and fall short, for example, you automatically realize you need to get a running start to clear it. You need to do this analysis on your real-life failures as well. Were you taking too many classes this semester? Should you have dropped a class? Was the class too hard? 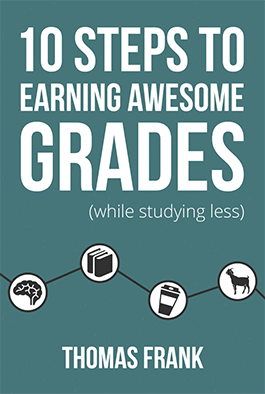 Were you simply unmotivated to pay attention or study? Did you fail to utilize good study techniques? Think about how you can retry in a smarter way going forward. Once you’ve created your improved plan of attack, it’s now time to simply do the work and retry. This couldn’t be further from the truth. Asking for help is showing that you’re smart enough not to accept ignorance out of pride or some fear of embarrassment. It’s not stupid at all. Plus, now that you’ve failed, you know you’re not above needing help. And none of us are. We all need assistance at times. So go to office hours. Get a tutor if you need one. Or simply raise your hand in class when you’re confused. It’s like being a passenger on a sinking ship. If someone comes by in a raft to save you, jump on that raft. Here’s the sad truth. A lot of people sort of let life “happen” to them. They let their past failures and wrong decisions dictate the course of their futures. There are very few failures that can completely prevent you from adapting and retrying. As long as you don’t give up, the vast majority of failures will simply make you smarter and more resilient in the future. Failure is not the end. Rather, it’s a source of insight. If you don’t like where your failures have gotten you, then learn from them and retry in a smart way. If you don’t like the person you were yesterday, start taking small steps today to change that person. 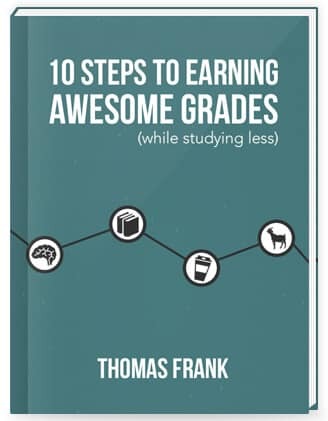 If you wan to learn study techniques that can help you avoid failure in the future, then check out my free 100+ page book called 10 Steps to Earning Awesome Grades (While Studying Less). Hopefully the article and these resources have helped you in some way! If you’d like to share any experiences you’ve had with failure, feel free to do so in the comments below (or on the YouTube video’s comments, where the discussion is a bit more lively).